Covercraft Custom Cab Coolers - allow pickup and SUV owners to protect the interior of the vehicle, even if you don't have room to carry around a full-size cover. Cab Coolers protect against the Heat, Sun and UV rays, as well as Frost and Snow during the winter. They are easy to install and held in place with hook & loop straps, usually at the door handles and under the mirrors. Sizes are available for regular and extended cab pickups. Cab Cooler protects the cockpit area from damaging UV rays and help reduce heat build up inside the vehicle. Cab Coolers use hook and loop fasteners under the mirrors and door handles (varies by model). Some patterns include adjustable webbing straps to wheel wells to securely hold the cover in place. 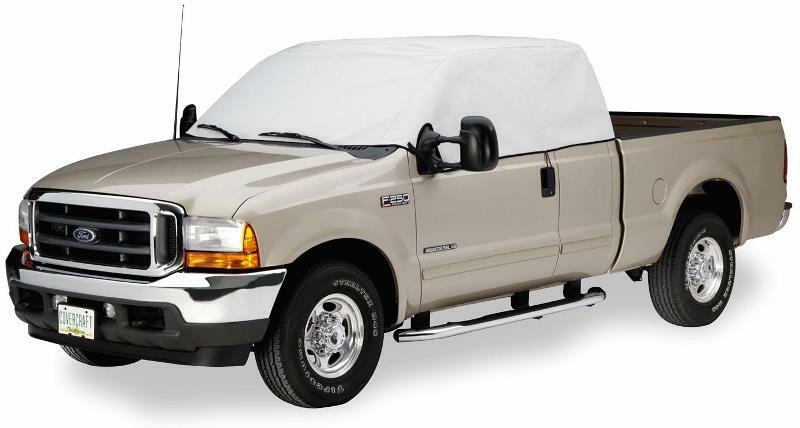 Covercraft Custom Cab Area Half Covers - Covercraft Half cover protects the entire front end, cab area & hood from heat, sun and snow. Custom patterned for a perfect fit, cab area covers go between the cab and pickup bed. Since it's not a full size cover, it's easy to store, and protects the interior from UV rays that damage your dash, leather, vinly and discolor carpet. A great way to protect the pickup cab area from the, sun, snow, bird crap & tree sap. Covercraft Interior Covers - Covercraft Interior covers are easy to use protection for convertibles when the top is down. Interior covers protect the windshield and interior from UV rays, airborne pollutants and droppings from trees and birds. Installation is easy, with hook & loop straps for door handles and or mirrors and most include anti theft tabs that are secured inside the trunk lid. These interior covers are great for summer use and are compact for easy storage. A full cover is always the best choice for outdoor protection answer, but for when on quick trips or limited space a interior cover does the job! Compact size, easy to store Interior covers are installed with the side windows down. Covercraft Hardtop Covers - Covercraft hardtop covers when the weather is great, and the hardtop is stored in the garage for the summer, here's a way to protect both the inside and outside while it's not in use. The cover uses hook & loop fasteners to attach the outer and inner portions of the cover together and it can be used with most hoists that are used to remove hardtops. Covercraft Car Truck SUV Van & Sta Wagon Covers are Custom Made in the USA!